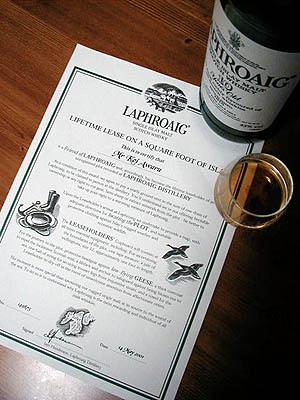 Mr Kei Awaru is a Friend of LAPHROAIG and, accordingly, has become the lifetime leaseholder of an Unregistered plot recorded at LAPHROAIG DISTILLERY. As a condition of this award, we agree to pay a yearly ground rent in the sum of one dram of Laphroaig, to be claimed in person at the distillery. You'll understand we're not offering heritable ownership or any right to cut peat, farm sheep or extract minerals from the plot - far better to take up your right to a warming measure of Laphroaig. Upon the Leaseholder's arrival at Laphroaig we undertake to provide a map, with adequate directions for locating the PLOT, and suitable protective clothing against Islay's rugged weather and eccentric wildlife. The LEASEHOLDERS' Cupboard will contain at all times essential equipment, including: For ascertaining the boundaries of the plot, one tape measure; a pair of wellingtons, size 12, approximately one foot in length. For the journey to the plot, protective headgear against low-flying GEESE; a thick overcoat to repel the inclement Scottish mist; a lifebelt and anchor to safeguard against being blown out to sea; one ball of string for securing trouser legs from inquisitive stoats; and a towel for the Leaseholder to dry-off in the event of unwelcome attention from affectionate offers.